Press Release: Linked Logainm has been launched! A new open dataset allowing Irish place names to be linked across the world by cutting edge technologies developed in Ireland is launched by Mr. Jimmy Deenihan, TD, Minister for Arts, Heritage and the Gaeltacht. L-R: Séamus Mac Giolla Chomhaill (Department of Arts, Heritage and the Gaeltacht), Micheál Ó Conaire (the Placenames Branch), Dr. Sandra Collins (DRI), Fiona Ross (NLI), Jimmy Deenihan TD, at the launch of Linked Logainm. Photo Credit: Lar Boland. Copyright NLI. Licence: CC-BY. 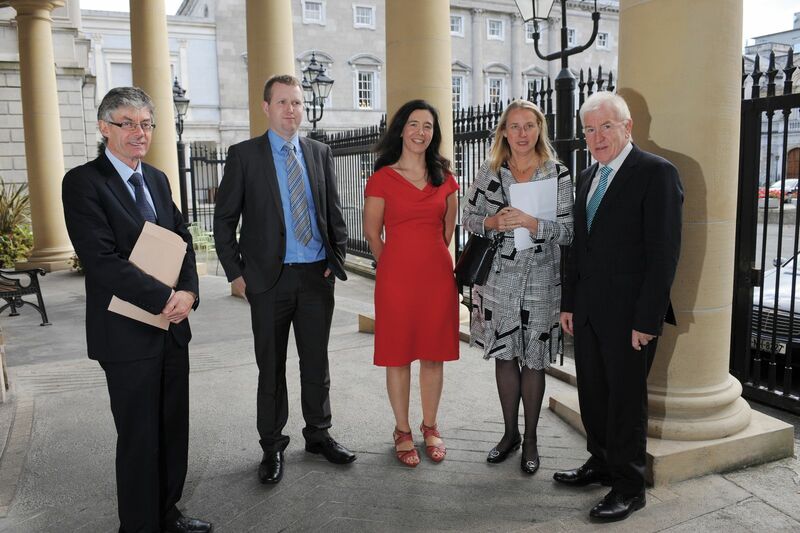 On Tuesday, September 10th the Linked Logainm resource was launched by Mr. Jimmy Deenihan, TD, Minister for Arts, Heritage and the Gaeltacht at the National Library of Ireland. The Linked Logainm project has created a new open dataset, which allows Irish place names to be linked across the world by cutting edge technologies developed in Ireland. 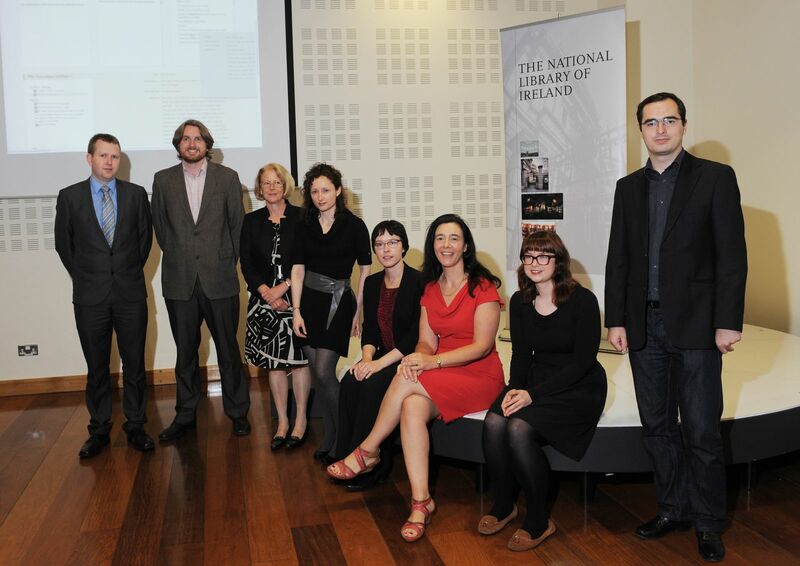 “I wish to congratulate all of the project participants – The National Library, The Digital Repository of Ireland, Fiontar at Dublin City University, INSIGHT @ NUIGalway and the Placenames Branch of my Department, for the work which they have put into this project. I am genuinely pleased to launch this digital resource, which will contribute to the promotion of our Placenames data as a resource for researchers including educators, students and genealogists as well as for heritage institutions including museums, archives and libraries, nationally and internationally. The new Linked Data version of the authoritative bilingual database of Irish place names logainm.ie is an open resource which can be widely used by web developers, computer scientists, researchers, the heritage community and librarians and archivists. Logainm.ie is an online database containing over 100,000 Irish geographical names generated by the Placenames Branch of the Department of Arts, Heritage and the Gaeltacht, and the database is being developed in collaboration with Fiontar, DCU. The Linked Logainm dataset is of potential use to any person, project or institution aiming to make content relating to Irish places available on the Web. The publication of logainm.ie data in a structured, computer-readable format allows its value to be re-used by computer scientists, web developers, the heritage community and information professionals. The project document "Using the Linked Logainm Dataset" provides use-cases and examples for those who are interested in working with the Linked Logainm data, and who have some technical experience. The project also built the Location LODer website, an interactive map where visitors can explore Irish place names, linked with historical context and maps, images and contemporary data. Location LODer was constructed using linked data technologies by INSIGHT @ NUIGalway and DRI, and gives an interactive introduction to the potential of the Linked Logainm concept. Linked Logainm data and a Google maps interface allow users to explore content from a range of digital resources relating to locations across Ireland. Users interact with a map of Ireland, navigating by county to discover pins which highlight relevant content for towns, villages, cities, rivers and streets. Clicking on the pin loads the available digitised content for the place, which may be sourced from logainm.ie, Wikipedia, the National Library of Ireland’s Longfield Maps collection, the Irish Historic Towns Atlas and Europeana.eu. My Location LODer allows the user to gather interesting source material, and to email links to their bookmarked content to other users. Visit Location LODer and logainm. Please contact Rebecca Grant, the DRI Digital Archivist, for further information. Tá tacar nua sonraí oscailte, trínar féidir logainmneacha na hÉireann a nascadh ar fud an domhain trí bhíthin teicneolaíochtaí ceannródaíocha a forbraíodh in Éirinn, seolta ag Jimmy Deenihan, TD, An tAire Ealaíon, Oidhreachta agus Gaeltachta. Sheol Jimmy Deenihan, TD, An tAire Ealaíon, Oidhreachta agus Gaeltachta an acmhainn Linked Logainm Dé Máirt, an 10 Meán Fómhair, i Leabharlann Náisiúnta na hÉireann. Is tionscadal comhoibríoch é Linked Logainm de chuid Taisclann Dhigiteach na hÉireann (DRI), INSIGHT @ NUIGalway (roimhe seo an Institiúid um Thaighde ar an bhFiontraíocht Dhigiteach DERI), Fiontar in Ollscoil Chathair Bhaile Átha Cliath, Leabharlann Náisiúnta na hÉireann agus an Brainse Logainmneacha sa Roinn Ealaíon, Oidhreachta agus Gaeltachta. Tá tacar nua sonraí oscailte curtha ar fáil ag tionscadal Linked Logainm, trínar féidir logainmneacha na hÉireann a nascadh ar fud an domhain trí bhíthin teicneolaíochtaí ceannródaíocha a forbraíodh in Éirinn. Acmhainn oscailte is ea an leagan Sonraí Nasctha den bhunachar sonraí dátheangach, údarásach de logainmneacha na hÉireann, logainm.ie, agus táthar ag súil go n-úsáidfidh forbróirí Gréasáin, eolaithe ríomhaireachta, taighdeoirí, an pobal oidhreachta, leabharlannaithe agus cartlannaithe go forleathan é amach anseo. Is bunachar sonraí ar líne é logainm.ie ina bhfuil breis is 100,000 ainm geografach de chuid na hÉireann. Is é an Brainse Logainmneacha sa Roinn Ealaíon, Oidhreachta agus Gaeltachta a shocraíonn na sonraí, agus cruthaíodh agus forbraítear an bunachar sonraí i gcomhar le Fiontar, Ollscoil Chathair Bhaile Átha Cliath.Beidh tacar sonraí Linked Logainm úsáideach d’aon duine, d’aon tionscadal nó d’aon institiúid a mbeadh suim acu ábhar faoi logainmneacha na hÉireann a chur ar fáil ar an nGréasán.Sa mhéid gur foilsíodh sonraí logainm.ie i bhformáid struchtúrtha, atá inléite ag an ríomhaire, féadfaidh ríomheolaithe, forbróirí Gréasáin, an pobal oidhreachta agus gairmithe faisnéise eile úsáid a bhaint as na sonraí sin. Sa doiciméad tionscadail “Ag Úsáid Thacar Sonraí Linked Logainm" cuirtear cásanna úsáide agus eiseamláirí ar fáil dóibh siúd a bhfuil taithí theicniúil éigin acu agus ar suim leo leas a bhaint as tacar sonraí Linked Logainm. Tá an suíomh Gréasáin Location LODer curtha ar fáil ag an tionscadal freisin, léarscáil idirghníomhach atá ann ar ar féidir le cuairteoirí logainmneacha na hÉireann a fhiosrú agus iad nasctha lena gcomhthéacs stairiúil, léarscáileanna, íomhánna agus sonraí comhaimseartha. Chruthaigh INSIGHT @ NUIGalway agus DRI Location LODer as teicneolaíochtaí sonraí nasctha, agus tugann sé réamheolas idirghníomhach maidir leis na féidearthachtaí a bhaineann le coincheap Linked Logainm. Cuirtear sonraí Linked Logainm i gcomhéadan le Google Maps ionas gur féidir le húsáideoirí amharc ar réimse acmhainní digiteacha a bhaineann le háiteanna éagsúla ar fud na hÉireann. Úsáideann cuairteoirí léarscáil idirghníomhach d’Éirinn chun dul ó chontae go contae agus aimsíonn siad pionnaí a nochtann faisnéis ábhartha maidir le bailte, sráidbhailte, cathracha, aibhneacha agus sráideanna. Ach cliceáil ar phionna lódáiltear an t-inneachar digitithe don áit sin, as logainm.ie, Vicipéid, bailiúchán Léarscáileanna Longfield de chuid Leabharlann Náisiúnta na hÉireann, Irish Historic Towns Atlas nó Europeana.eu. Is féidir le húsáideoirí My Location LODer a úsáid chun ábhar spéisiúil foinseach a bhailiú le chéile, agus naisc chuig an ábhar ar chuir siad leabharmharc leo a chur tríd an ríomhphost chuig úsáideoirí eile. Tabhair cuairt ar Location LODer ag http://apps.dri.ie/locationLODer/ agus ar logainm.ie ag www.logainm.ie. Tuilleadh eolais, déan teagmháil le Rebecca Grant, cartlannaí digiteach DRI.